Cyrus the Great (ca. 559-530 B.C.) - Who was the second greatest "Great" after Alexander the Great? Cyrus the Great would be a strong candidate. He founded an empire, and a dynasty that would last the entire span of that empire. He conquered Babylon and freed the Jews from their exile, allowing them to return to their homeland. And he re-defined the meaning of world empire as his conquests stretched further than any conqueror before him. Cyrus raised Persia from a client state of the Medes and never looked back. His first victory came in 550 B.C. when he defeated the Median King Astyages, who according to Herodotus, was his grandfather. Before this time little is known about his life as records are scant. His year of birth is commonly accepted as ca. 600 B.C., but some traditions place it later than that. Upon hearing of Astyages' defeat, King Croesus of Lydia saw an opportunity to expand his kingdom . Herodotus records the famous account of Croesus consulting the Oracle at Delphi to determine whether or not he should attack Cyrus. The Pythia (priestess), in one of the most famous oracles in history, told Croesus that if he went to war with Cyrus he would destroy a great empire. Interpreting this as a victory, Croesus marched his army and met Cyrus at the Battle of Pteria in 547. The battle was inconclusive. However, as Croesus retreated to his capital of Sardis for the winter, Cyrus pursued him. Croesus' plan was to bolster his troops for the following season. Cyrus knew this and besieged the city before he could. Sardis fell in early 546 and Cyrus conquered Lydia. So the Oracle was correct in the sense that the great empire Croesus destroyed was his own. 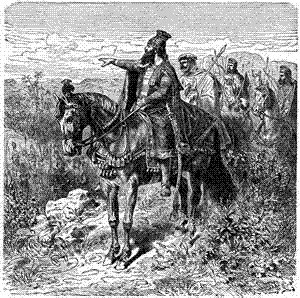 In 540 B.C., Cyrus defeated the Elamites and captured its capital of Susa. Like the Medes, the Elamites were also a related Iranian people and were simply brought into the fold of the Persian Empire. Susa became one of its great cities and served as a capital for some of its kings. The other great conquest of Cyrus' career was Babylon in 539 B.C. (see Fall of Babylon below). He died in battle against a Scythian tribe known as the Massagetae in 530.